I had to laugh when I looked back on my last post. 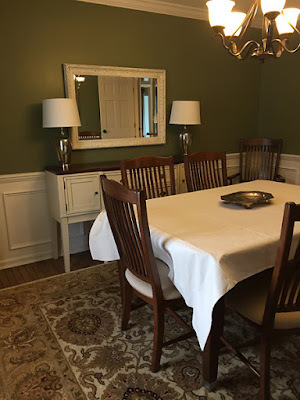 I gave you all the details about the plan for our kitchen remodel… the lighting, cabinets, sink countertops, flooring, chairs, etc. But, I realized later that I didn't even mention any materials that are actually used for the main purpose of the kitchen: cooking! I guess you can tell how much I love to cook :) Oops! Oh well. Why don't we focus today on something I do love… before and afters!! The room had nice hardwood floors and wainscoting, but was lacking any pizazz. My client had painted the room twice, and still wasn't pleased with the color. 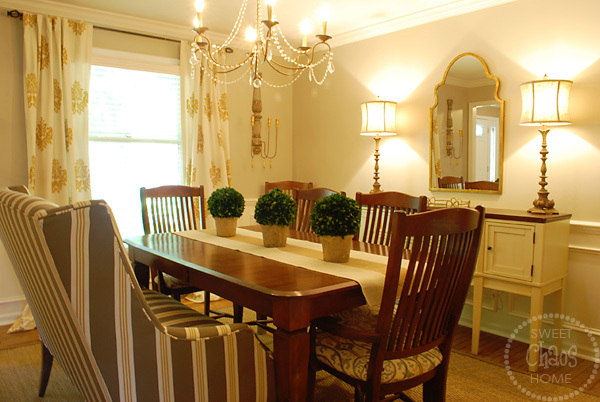 She wanted the room to be a bit more feminine with a vintage vibe, yet still kid-friendly for her two young sons. 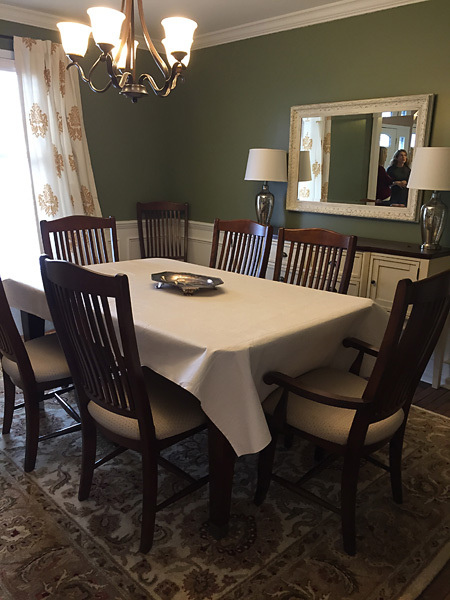 The existing furniture and drapes had to stay, so I used the color of the drapes as the starting point for the new color palette. 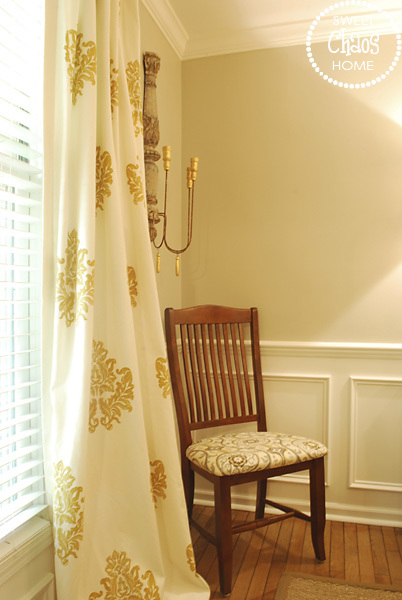 We brightened up the space by painting the walls "Revere Pewter," and replacing the black chandelier with a delicate gold one with a more feminine, vintage look. The chair seats were recovered in a pretty suzani fabric, and a new mirror and buffet lamps add height and interest to the sideboard. 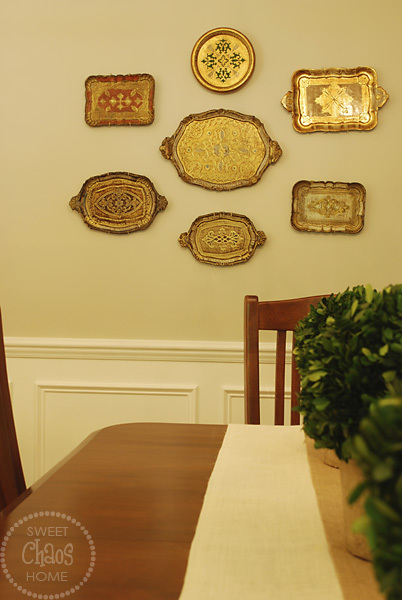 My client likes vintage pieces, and was enthusiastic when I suggested that she create a gallery wall with an assortment of Italian florentine platters. She found these beauties on ebay. 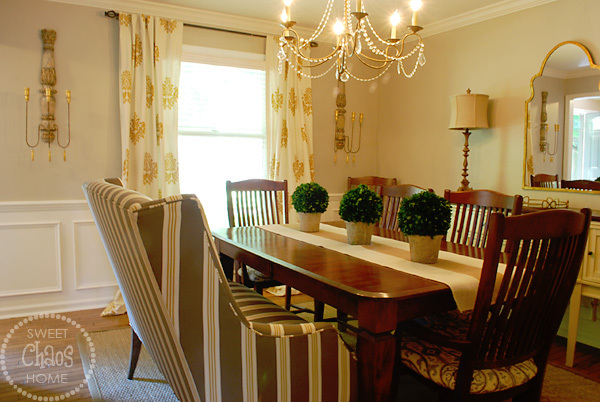 Perhaps my favorite item in the room is the beautiful dining bench we had made in a custom indoor/outdoor fabric. The fabric is soft, comfortable and durable… can't beat that! The bench adds some softness to the room, and breaks up the sea of wooden chairs. 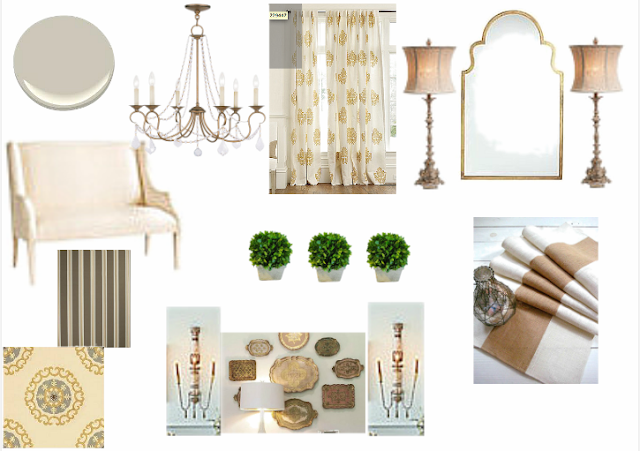 We still need to add candles to the new sconces flanking the window and pillows to the dining bench. Some framed photos will also be added to the wall behind the dining bench. I will take pics when it's complete, but I just couldn't wait to share this pretty space with you! We are currently renovating her master bathroom, and it is going to be a stunner!! Can't wait to share it with you. I thought the before was good but the after is amazing. You have infused the room with light. I'm impressed by the tall lamps and bench. Excellent job! Thank you so much for your sweet words, Donna! I am thrilled with your clients progress in her dining room!!! 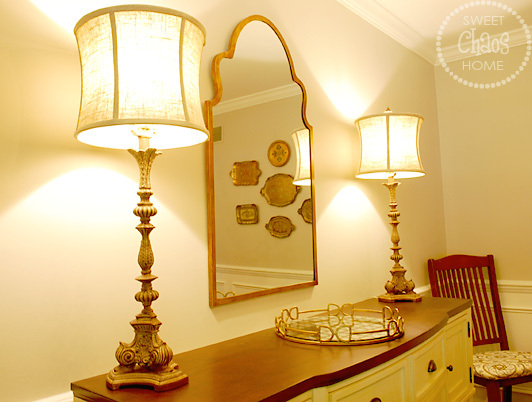 The lamps and the mirror change are exquisite!!! 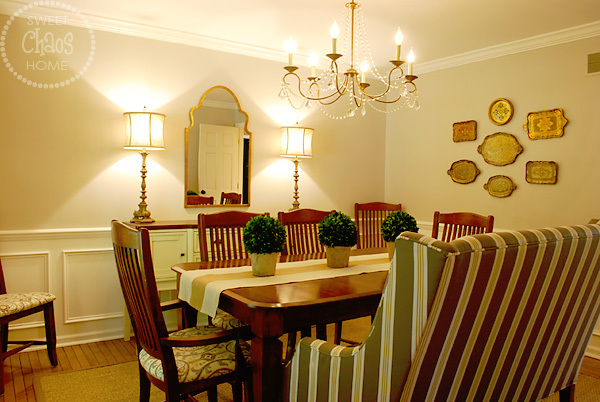 I adore how they raise your eye upward above the dark wood of the dining room chairs!!! Before switching out the mirrors, most furniture and accessories were rectangular. you've given this room a softer appeal within the space!!! Thanks for sharing. . .I'll be checking back to see the total finished project!!! Just beautiful Carolyn. 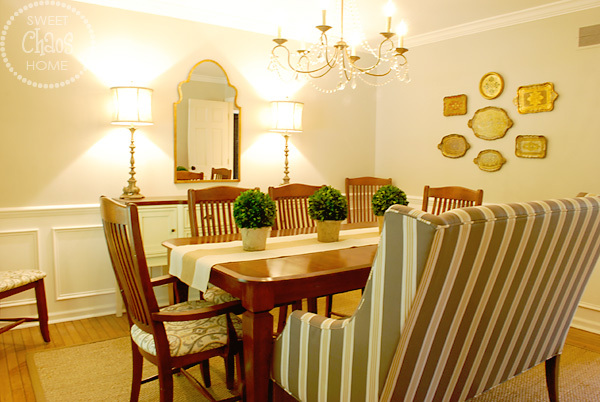 I love so many elements in this room but I have to agree the dining bench is a complete show stopper! Thank you for sharing at SYS and have a great week! Grete Post!! thank you ! So great! Hope to see more posts from you!